Fargo HDP Film is required for printing cards with Fargo HDP printers. Fargo HDP printers print your card image to underside of 84054 HDP film. The film is then applied to the surface of the card, "sandwiching" the image between the film and the card. 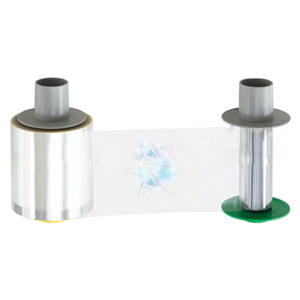 The holographic design of Fargo 84054 HDP film secures your cards by protecting them from tampering and counterfeiting. Fargo card printers require specialized Fargo HDP film to function properly. To maximize printed card quality and printer durability, use only genuine Fargo HDP film.